I may have found a particular kind of soap the other day at my local health food store which I believe might just be as theraputic and healing as any Hot Spring. 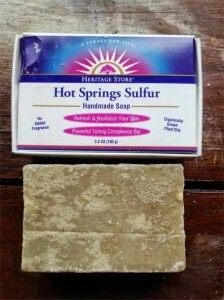 This handmade soap by ‘Heritage Store’ is actually made with Hot Springs Sulfur. This soap has every quality of an Organic Hot Spring Bath. Picture yourself lounging with your girlfriend in a natural Hot Spring. The sensation is just like that. It also really does smell like some kind of sulfur but very mild and earthy. I now use this soap after all vigorous work outs after realizing that it helps heal sweaty skin rashes instantly. Totally Hip and Cool. Ingredients: Saponified Oils of Olea europaea (Olive) Fruit Oil*, Cocos nucifera (Coconut) Oil*, Elaeis guineensis (Palm) Oil*, Argentum metallicum(Colloidal Silver), Sulfur (Powder), Celtic Sea Salt, Sinapis hirta (Yellow Mustard) Powder, Rosmarinus officinalis (Rosemary) Leaf Extract, Carthamus tinctorius (Safflowers or American Saffron).